My mouth is watering just looking at this. Mmm, brussels sprouts. My current obsession is brussels sprouts but not the steamed or boiled varieties. No, I specifically LOVE brussels sprout CHIPS. The crisp leaves baked/roasted in an oven are UH-mazing. In fact, the burned-looking ones are the best. Ever since I had a big ol’ bowl of them at Craft in Century City, I could not get enough. I’ll even go so far as to say Craft’s are the best brussels sprouts I’ve ever had. They’re the perfect finger food and would be better than popcorn at the movie theater, so next time I see a film at the nearby mall, I’m going to pick up an order to go and then maybe sit in the back row so its lovely scent won’t make too many of my seat mates jealous. And even though I’m more a baker than a cook, I resorted to making my own chips at home with the help of this recipe. I like to make it as a snack or top quinoa with it for added texture. Thankfully, it’s soo easy to make. Olive oil, salt and pepper, throw it in a 425-degree oven for 10 minutes and then boom! Nirvana. If I feel adventurous, I’ll throw some Sriracha on there. Parents, if you’ve had trouble getting your kiddies to eat brussels sprouts in the past, you’ll have no trouble once you set a pile of these lovelies in front of them. Nom! For the non-DIYers, here are some of my other favorite brussels sprouts dishes around town including future favorites I have yet to try and their recipes. If you’re looking for an even more comprehensive list of who’s doing brussels sprouts in L.A., cuz you’re weird like me, click here. 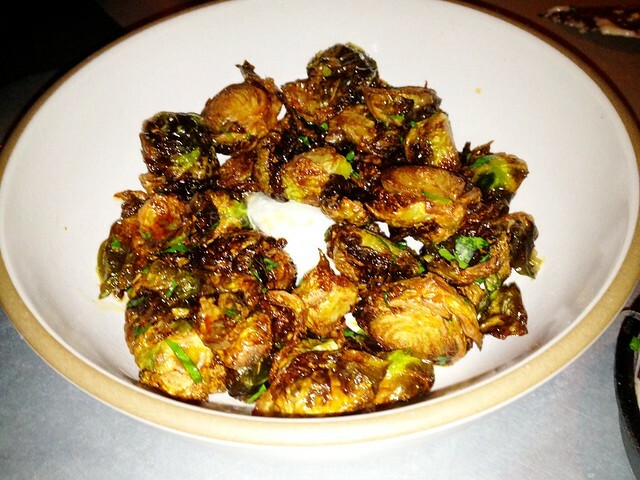 Craft’s crispy brussels leaves and aleppo pepper must have crack in them because I can’t get enough of them. I crave them ALL. The. Time. In fact, I’m gonna go there tonight. And although I’ve had plenty of brussels sprouts before, these are the ones that kicked off my recent addiction. I credit the crispness which spoils all other seemingly limp versions for me. You can pop fistfuls of leaves in your mouth if a fork isn’t cutting it for you. Craft is the only place I’ve found that actually takes the leaves apart. Seems most restaurants either cut the sprouts in half or serve them intact. Yup, there are some saucy Red Medicine brussels sprouts under there. 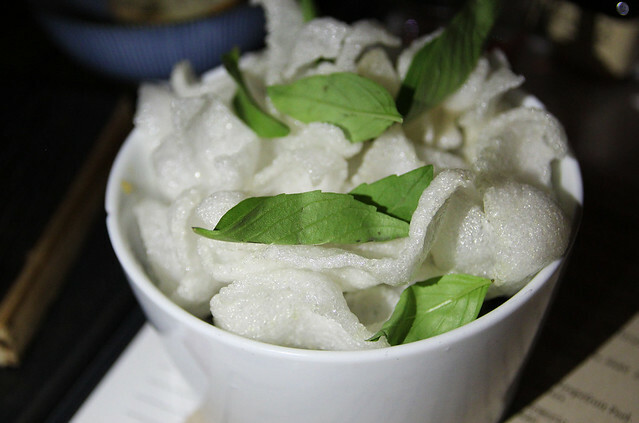 Red Medicine’s brussels sprouts with caramelized shallots, fish sauce, vermouth are buried under a layer of rice chips. Not vegan-friendly by any stretch because of the fish sauce, however. And it’s the fish sauce that may be a bit much for some folks. The dish is almost too saucy and kinda salty, although not thirst-inducingly so. In any case, Red Medicine doesn’t have much in the way of vegan fare so I usually fall back on my chegan ways and order this up at the bar with some cocktails. If you’re into the fish sauce, here’s a recipe for Momofuku’s roasted brussels sprouts with fish sauce vinaigrette. Mohawk Bend’s brussels sprouts are available as the vegan-friendly apples and almonds version or the savory bacon and bleu cheese route. I went for the vegan version and loved the crunch added by the almonds but this was more sweet than savory for me. Personally, I prefer my sprouts with some spice and savoriness. Freddy Smalls Fried Brussels Sprouts with goat cheese and apple cider glaze. No crispiness here but the gorgeous charred parts are still evident. These are best enjoyed with one of the craft brews that they have on draft. Good round-up. I enjoy the Brussels sprout salad at The Hart + The Hunter, and the deep-fried Brussels sprouts at Carnitas Snack Shack in San Diego. Tin Roof in Manhattan Beach has amazing brussels sprouts.